Dendrobium lawesii bicolor outcross #2657 ('pink/white' x 'red/yellow') (approximately 25 seedlings per flask). 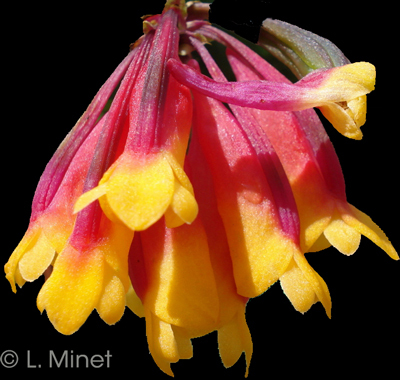 The Species: This species comes from New Guinea and Bougainville Island. It grows as an epiphyte in misty forest in shaded conditions at elevations from 2600 to 6600 feet. The flowers occur in clusters of up to 6 flowers at any point along the cane. It can bloom on new or old growth and old growths will bloom for several years so it makes a wonderful specimen when it gets larger. Culture: I grow it in intermediate to intermediate-cool conditions with moderate light. I grow it both potted (bark mix or sphagnum moss and staked upright) and mounted (as a pendant plant). Give it year round moisture with dilute fertilizer. I do not let it stay dry for any extended period of time. 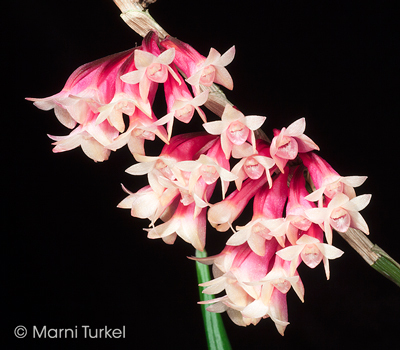 Capsule Parent: Dendrobium lawesii 'pink and white'. This is not the actual parent but is a good representation of it.